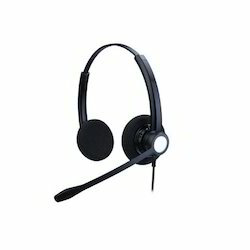 Manufacturer of a wide range of products which include headset microphone, noise canceling headphone, office call center headset, professional call center headset, telephone headset and communication headphone. Supported by our sophisticated infrastructure, we are capable of providing a large gamut of Headset Microphone to our valued clients. 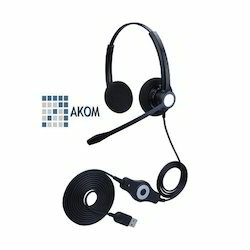 These are offered with comfortable noise canceling microphone and applicable in intensive call Centers environment. 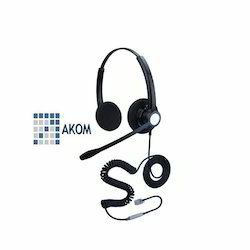 Also, with these handsets, retractable ear buds card can be freely adjusted which allowing you to free up your hands, feel free to communicate and make calls more easily and efficiently. 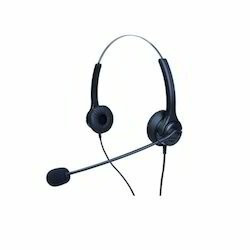 We are engaged in manufacturing a wide range of Office Call Center Headset in the market. These handsets have the noise-canceling microphone which filters out background sound and clear voice transmission. Apart from this, customers can avail these handsets in several specifications and in bulk quantities, as per their requirements. 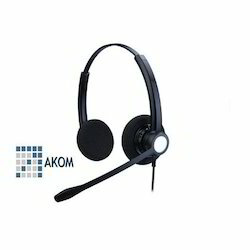 AKOM J10 is RJ / USBProfessional Call Center Headset are manufactured from best quality material at our state of art infrastructure unit and these are safe to use, reliable and have a longer life. These can be rotated 300 degrees when you rest, flip tone arm outward. Also, in this offered range J-10 D headset optional interface has a standard RJ interface for the traditional telephone. Supported by our sophisticated infrastructure, we are capable of providing a large gamut of Telephone Call Center Headset to our valued clients. 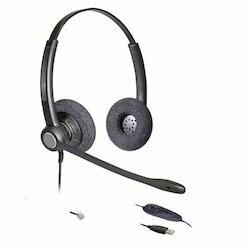 These are offered with comfortable noise canceling microphone and applicable in intensive call Centers environment. Also, with these handsets, retractable ear buds card can be freely adjusted which allowing you to free up your hands, feel free to communicate and make calls more easily and efficiently. Supported by our sophisticated infrastructure, we are capable of providing a large gamut of Noise Canceling Call Center Headset to our valued clients. 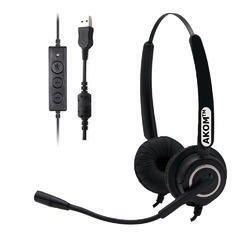 These are offered with comfortable noise canceling microphone and applicable in intensive call Centers environment. Also, with these handsets, retractable ear buds card can be freely adjusted which allowing you to free up your hands, feel free to communicate and make calls more easily and efficiently.